I remember going to teddy bear picnics as a child and until I was a mom, I had no idea they were still a thing (which btw they are). I took my two, picnic in hand, to the Saskatoon Mommy Connections and Singing With Sylvia Teddy Bear Picnic at beautiful Meewasin park and wanted to share the fun with you whether you attended, meant to (it's annual, hit it up next year), or just wanna relive your childhood a bit. 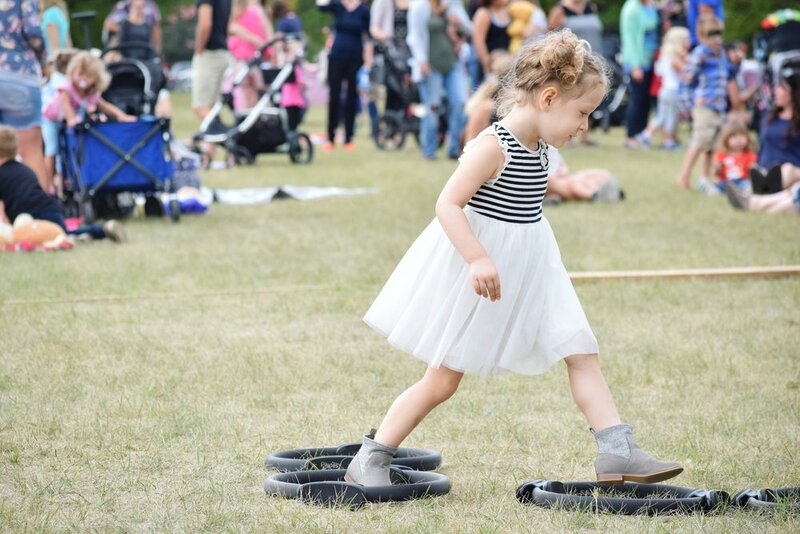 Lead Pilates set up the cutest obstacle course complete with rolling bridge (wooden rods lined up) and balance beam. It was cyclical with no real start point and I think Petra went through it like twenty times. Little Hands and Me Parenting Network and Learn & Play Cafe had sensory bins set up though I don't have a ton of pictures because Sir was all up in there and that meant I was, too. There he is with a ball from the ball pit and a ziplock squeeze bag of foam and blue liquid. He was happy. If you live in Saskatchewan, you know Singing With Sylvia to be a hit, every time. She also had a little book reading sesh, very cute. Other things that were going on that we would have hit up if the kids weren't so single-minded were a Bear T*L*C Station (bandaids for bears), Make & Take Bear Masks, a photo booth, cake draw, fingerprint craft with Smallprint, and facepainting by Kreative Mum. Did my kids enjoy the day? That face above says YES. It was also great to connect with other parents and a few of Petra's friends she apparently can recognize from a block away ("Hey, mommy," she said, pointing to a purple speck in the distance, "That's Harlow, let's catch up with her!") Thanks to Saskatoon Mommy Connections and Singing With Sylvia for having us. And in related news, I'm excited to announce that I'm going to be a Mommy Ambassador for them starting this autumn. Which, as it turns out, is only days away. Wha?